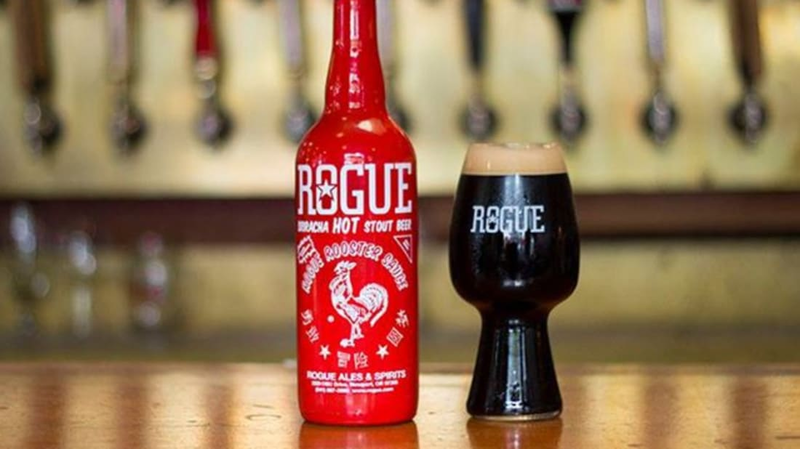 You can get almost anything Sriracha flavored these days, and now, thanks to the Oregon-based Rogue Brewery, there's one more way to enjoy the sauce: in beer form. Rogue is no stranger to unusual beer flavors—they once even made a beer using yeast from their brewmaster's beard—so this new beer sounds pretty standard. It's made with the real stuff: Huy Fong original hot chili sauce and sun ripened Rogue Farms ingredients. The bottle even comes decked out to look like the original red bottle, complete with green cap. Just like the sauce, Rogue recommends you have this beer "with soups, sauces, pasta, pizza, hot dogs, hamburgers, chow mein, or anything you'd like to wash down with a spicy kick." Fans of spicy beer can pre-order it on the Rogue site ($13) and expect it sometime after Dec. 8. For more spicy food flavored beer, also check out Evil Twin's Spicy Nachos.